Rent Embassy Suites Denver - Southeast | Corporate Events | Wedding Locations, Event Spaces and Party Venues. Our full-service hotel will impress you with first-class accommodations and amenities! 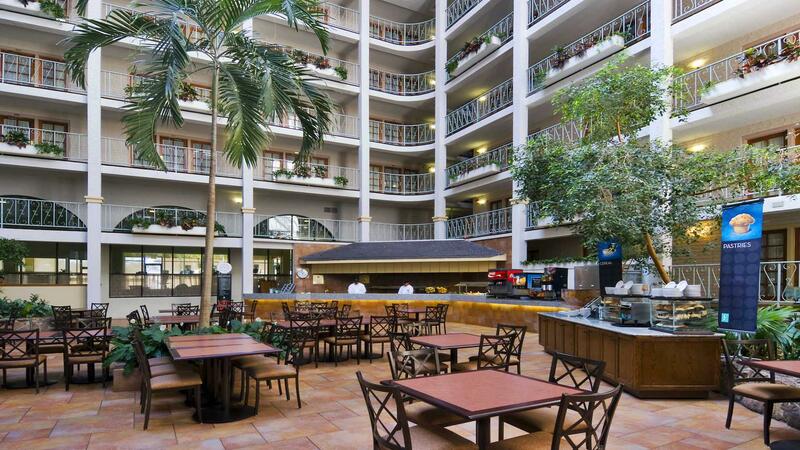 To ensure that your stay is enjoyable and rejuvenating, the Embassy Suites hotel provides a safe and comfortable environment in our recently-renovated suites surrounding a sleek and modern atrium. Here at the Embassy Suites by Hilton Denver Southeast, we know how important it is that your wedding goes off without a hitch, and that's why we put so much effort into making your special day one to remember! A dedicated wedding planner with years of experience is ready to help you plan the event of your lifetime. From big picture items like extravagant menus to small details like freshly pressed linens, we are here to make your wish our command. Our beautiful hotel features over 10,000 sq. ft. of flexible reception space accommodating 30-300 people complete with elegant chandeliers, built in dance floor, and a lush indoor garden atrium with picturesque waterfalls that provide a beautiful background for your ceremony.